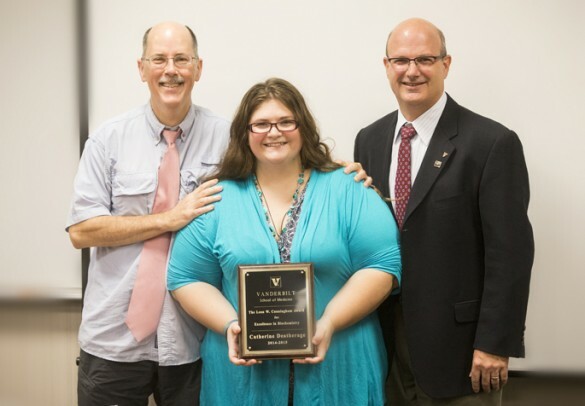 Catherine Deatherage, a graduate student in the lab of Charles Sanders, Ph.D., received this year’s Leon W. Cunningham Award for Excellence in Biochemistry during a presentation last week. The award, named for the late Leon Cunningham, Ph.D., former chair of the Department of Biochemistry, is given annually to a graduate student in Biochemistry who exemplifies Cunningham’s commitment to scientific excellence. At left is Sanders, the Aileen M. Lange and Annie Mary Lyle Professor of Cardiovascular Research, and at right is John York, Ph.D., the Natalie Overall Warren Professor of Biochemistry and chair of the department.